Most lovers of cake and pastry have eaten crème pâtissière without knowing what it is. A French standard, crème pâtissière—prnounced CREM pah-tees-YAIR, French for pastry cream—is a stirred custard thickened with cornstarch or flour and typically flavored with vanilla (other flavors can be used). 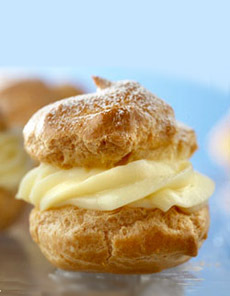 A cream puff: pâte à choux (puff pastry) filled with crème pâtissière (pastry cream). Photo courtesy American Egg Board. 1. WHISK together the egg yolks and sugar in a medium heatproof bowl until the sugar is dissolved. Set aside. 2. COMBINE cream and 1 cup of the milk in a saucepan. Scrape the seeds from the vanilla bean into the cream mixture; then add the scraped pod. Bring to a simmer; then remove from heat and set aside for 15 minutes. 3. PREPARE an ice bath: Fill a large bowl with cold water and add three cups of ice cubes. 4. COMBINE the cornstarch with 1/2 cup milk in a small bowl or mug. Stir thoroughly to break up any lumps (they often hide on the bottom of the cup) or they’ll end up in the crème pâtissière. 5. PLACE the saucepan with the cream mixture over a medium heat and bring to a simmer. As soon as bubbles begin to form around the edges, remove the pan from the heat. Be sure the mixture doesn’t boil. 6. SLOWLY pour the hot cream mixture into the egg yolk mixture, whisking constantly (or pour in a small amount of cream, whisk and repeat). If the hot cream is added to quickly, the eggs will scramble. 7. POUR the cream and eggs mixture back into the saucepan. Add the cornstarch mixture, stirring constantly over medium heat until the mixture is very thick. 8. MOVE the saucepan into the ice bath, adding more ice as necessary to keep the water very cold. Stir rapidly for a minute, until the cream has cooled slightly. 9. REMOVE the vanilla bean. Add the butter and stir until it is completely combined and the pastry cream is smooth. Store in a bowl with plastic wrap pressed against the entire surface of the cream, so that no skin forms. Seal with more plastic wrap and store in the fridge until you’re ready to use it. The cream can be made up to 3 days in advance.